Valentine's Day is just around the corner and I have the perfect dessert to make for the Nutella lovers in your life. Better yet, the perfect dessert to make for your Nutella loving self! As usual, I'm psyched for Valentine's Day. I appreciate a day devoted to love (of all kinds) in a world increasing filled with hostility. I'm terrible when it comes to waiting until the actual holiday to give someone their present, so Macky already received his Valentines's Day gift...unwrapped, the moment it got delivered last week. Sigh. Now let's talk about these cookies. 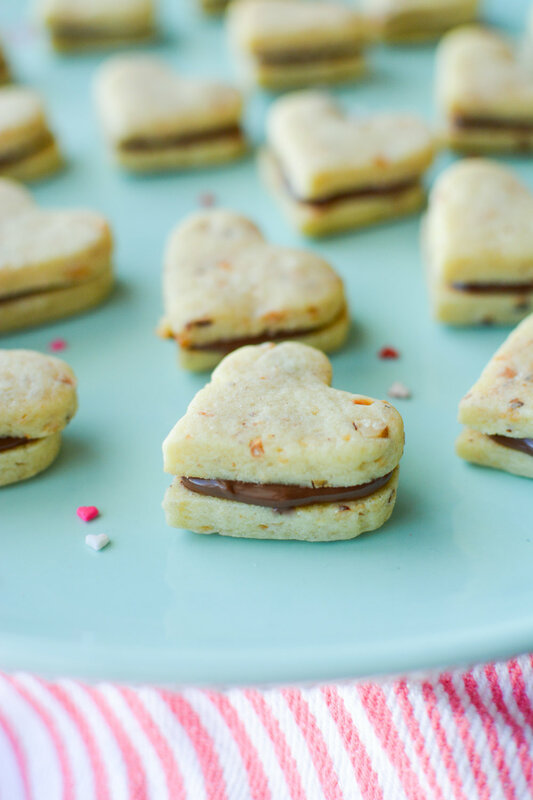 Hazelnut butter cookies stuffed with Nutella...can a cookie be more enticing? The butter cookie base is my favorite go-to recipe with my secret flavor packed ingredient. I've mentioned it many times before, but french vanilla coffee creamer in baked goods is life changing. Lastly, we add chopped roasted hazelnuts to the dough and place it in the fridge for at least 3 hours. This will make it easier to roll out, help keep the heart shape when it bakes and allows the flavors in the dough to really come through.